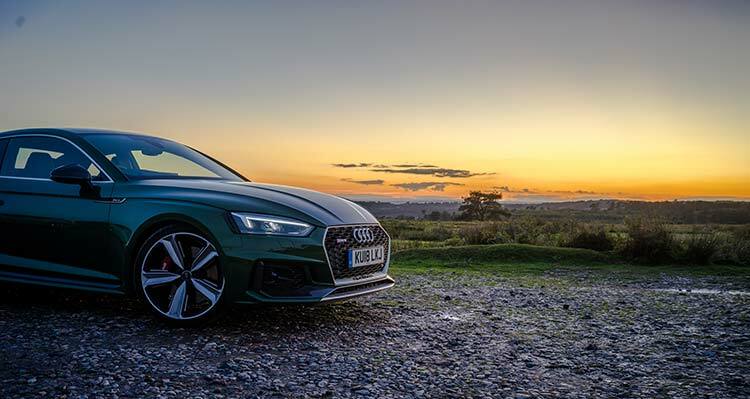 Audi RS5 Carbon Edition Review – Classy Coupe For Speed Freaks! In case you’re now wondering whether you miss-read the intro; yes, it did say £12,500. That’s on top of the £63k base price… gulp. So, what does this bumper pack of goodies have to offer? Well, quite a lot as it happens. Various pieces of exterior trim have been refined and replaced with carbon fibre counterparts, including the wind mirrors, front splitter, roof, sill inserts & diffuser inserts. A subtle carbon spoiler has also been added to the tail of the boot. All of this helps to drop the weight of the car – particularly in the case of the roof where that weight is lost high up on the vehicle, improving the centre of gravity. Utilising machining usually reserved for super sport and motorsport wheels, Audi were then able to remove further weight from the rims – another 8kg gone. In total, Audi have managed to fettle away 80kg – a feat not to be sniffed at, equating to a 5% drop in overall mass. Running the maths, this equates to £156 per kilo: offer this kind of return on investment to a motorsport chief and they’d bite your hands off! The carbon pack isn’t just about the exterior appearance, with lavish carbon fibre trim pieces adorning the cabin space and engine cover. Fine Nappa leather seats with contrast stitching also come as standard, whilst privacy glass, matrix LED headlights and the all-important RS Sport exhaust system round things off. 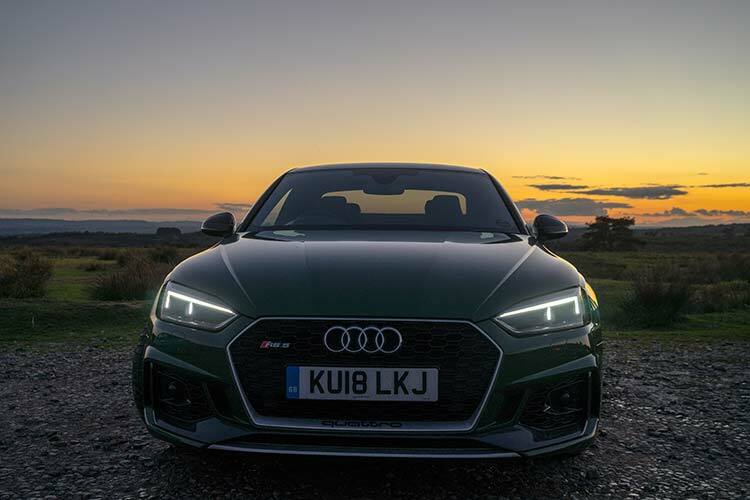 In terms of the body shape, Audi’s ‘RS’ styling enhances the coupe body of the A5 perfectly, with the bulked arches, angular chin and diffuser area creating a beautiful blend between sleek and menacing. 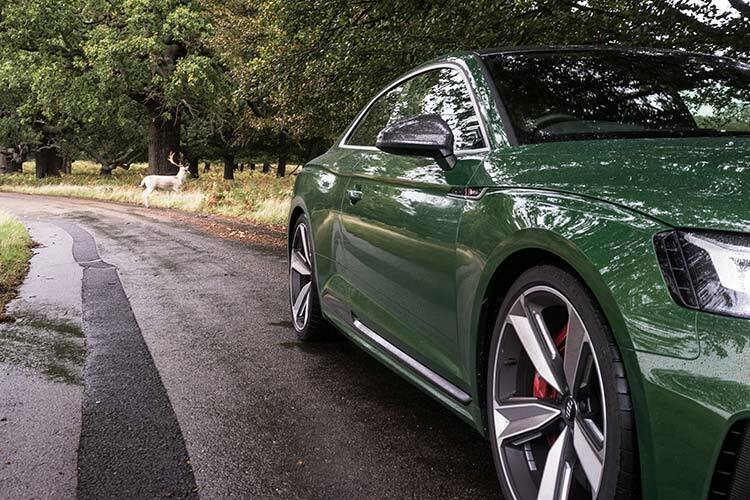 It’s difficult to imagine a scenario where the RS5 wouldn’t make a classy entrance – the RS5 is one fine looking coupe. Carbon fibre, fine Nappa leather & Alcantara; is there a stronger ingredient set for an interior? The RS5 blends them all together seamlessly, creating an interior that looks and feels every bit as luxurious and sporty as the name badge demands. 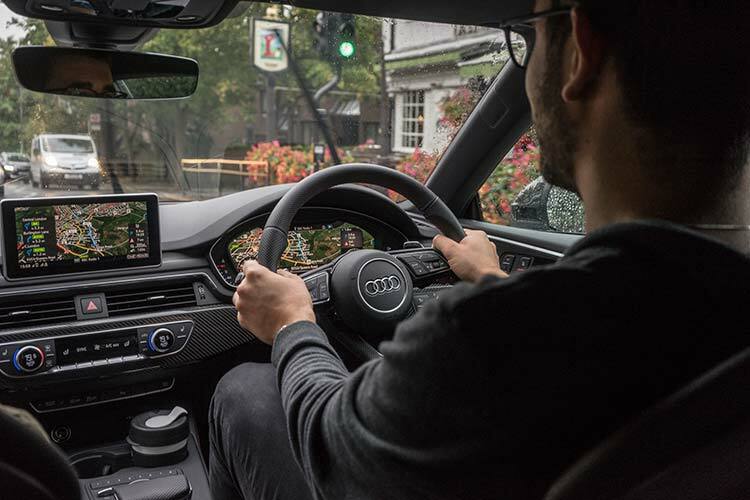 Whilst the RS5 doesn’t currently run Audi’s latest MMI (infotainment) incarnation (see our A8 review here for more on that), in this car it doesn’t feel like you’re missing out. 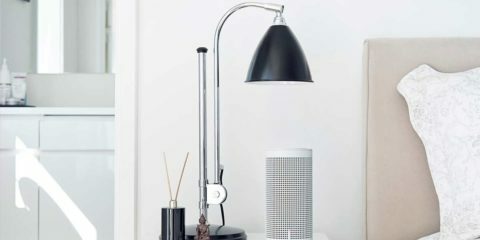 The more button focused, less tech heavy approach fits the sports car feel, making basic commands possible without taking your eyes off the road to check the touch screen. The central screen is the only place for gripe, as it doesn’t fold away nor does it look well integrated; the ability to fold it away when not in use would be a real plus, particularly during spirited drives. Aside from the cabin up front, there’s just about room for two passengers in the rear – we’re glad Audi didn’t try and carry this off as a 5-seat, as it is a bit of a squeeze with two adults in the rear. Boot space too is ok, although it fills quickly when you start applying suitcases – two or three are the max. Massaging, heated front seats and Audi’s superb virtual cockpit (both standard on the RS5) round off the cabin very nicely. 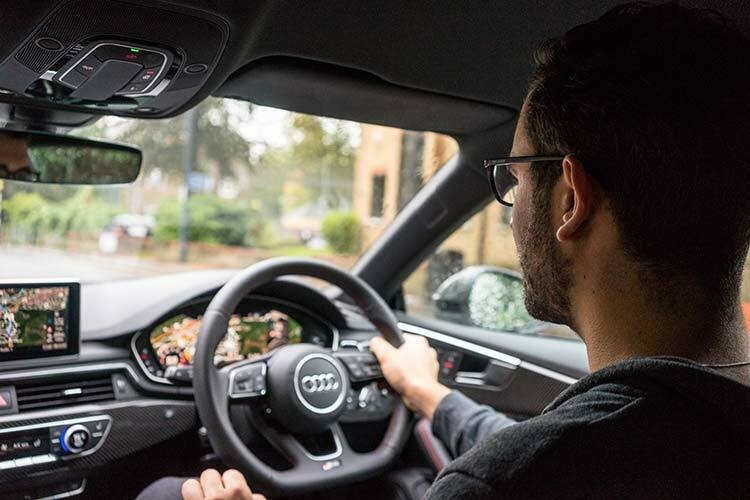 Throw in the nifty seat belt presenters (which avoid you awkwardly reaching behind to find them when firing the car up) and it’s obvious Audi have worked seriously hard to perfect the experience for the front two passengers. Based on our experience, they can be very pleased with the outcome! This isn’t MSF’s first experience of the RS5’s V6 drivetrain, having sampled it for the first time in Malaga for the RS4 launch (link here). 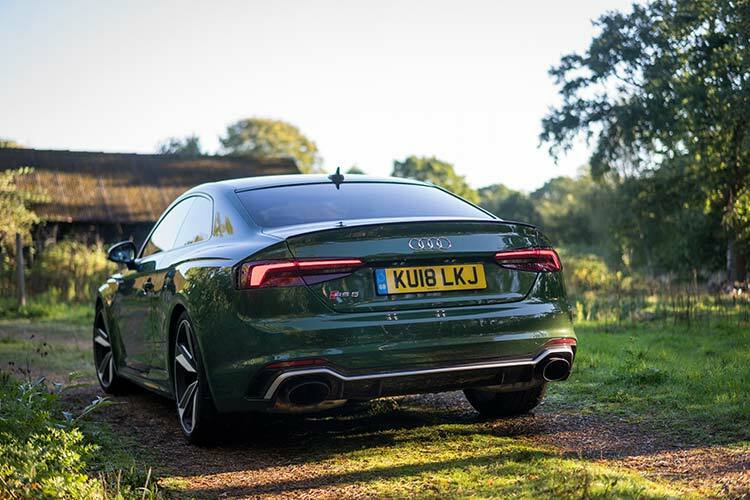 However, the V6 feels more at home in the RS5, suiting the slightly more sports-focused, coupe ethos of the car down to the ground. This goes for the sound too, which through the RS Sport exhaust is a fine sound track to drive to. The coupe shell is lighter too, dropping the 0-60 time of the RS4 from an already-impressive 4.1 seconds to 3.9. The same 8-speed transmission is employed; a unit we had reservations about after our tests of the RS4. However, we’re pleased to report a better experience in the RS5, with the RS4’s hesitation during shifts non-existent. Fuel economy too was very good – long runs saw the figures hover around the 30mpg mark; no small feat for a motor pumping out ~450hp. 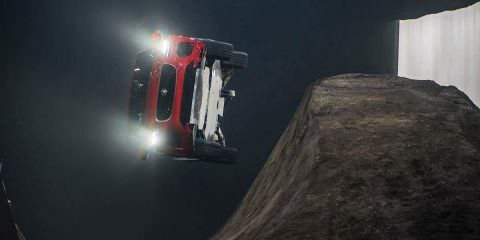 Of course, push the RS5 hard and these tumble, but for the performance on offer it’s hard to feel aggrieved. So aside from straight line blasts to 60, what’s the RS5 like on the road? Well, once you get over the initial excitement with the accelerator pedal, it’s a very civilised place to be. Dialled back into comfort mode, it’s exactly that, with the ride superb, steering light and visibility great. The throttle is a tad on the lazy side, even for a ‘comfort’ mode, but there really is little to criticise the RS5 on. Switch into dynamic and the drivetrain sharpens no end and the throttle pedal is just how you’d want it. The low-end torque provided by the V6 is plentiful and break-neck speeds approach at an alarming rate of knots. Chuck the RS5 into a bend and it’s doesn’t shy away. The V6 engine of this generation is considerably lighter than those of the past, improving front end performance & feel. This allows the nose to really tuck in when cornering, giving far more driver confidence. Sending power to all four wheels negates some of the excitement offered by a rear-drive, but the RS5 does a good job of encouraging spirited driving without ever letting things get scary. RS sport suspension ‘plus’ came fitted to the model on test (a £2000 option), offering up changeable damper settings depending on the cars mode. The system works well, although it duly spent 95% of the time in its ‘soft’ setting; the harsher setting reserved for known roads where the hazard of a jarring ride over pot-holes was reduced. When will the UK government sort out the roads?! When I first saw the RS5, I thought it was a very slick looking car. When I jumped into the RS5 and took off that’s when I knew I had my dancing shoes on. Loved the performance, the feel and the comfort. The sound was electrifying and the power was plenty. This is a statement car for business and regarding boot space it’s more than ample for everyday needs. Driving down the M40, was alot of fun and I was really impressed with it’s power the feel good factor and that sound of an engine. It’s one of my favourite, cars. Before driving the RS5, I would shamefully have ranked it towards the lower end in terms of ‘desirability to drive’ from Audi’s RS line-up. 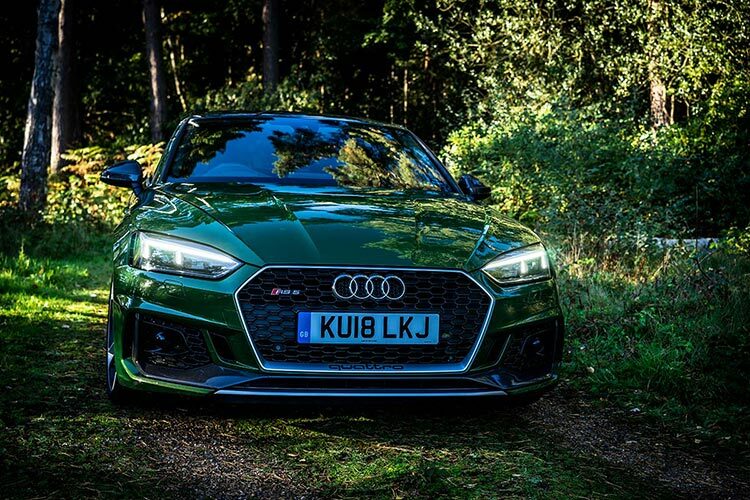 Audi are well known for their fantastic fast estate cars, but when it comes to sporty coupes other names typically jump to mind first – not least Audi’s rivals in Bavaria. However, the more time I spent in & around the RS5, the more it grew on me. The carbon highlights, spot-on styling & Sonoma green paint are a visual treat, whilst the sheer power of the drivetrain never fails to make you smile. The interior too is nigh-on perfect. Dare I say it; as an overall package, my favourite RS Audi to date. Thank you to Audi UK for providing our review car.